love the chairs.. where can i find these? As Designers, we buy direct from the manufacturers so you will most likely need to google the manufacturer name and item to find where you can purchase locally. The chairs from Orient Express: Head Chairs #7120 Maison Dining Chair in birch fabric with small brushed brown nails. Side Chairs #7104 Graham Dining Chair in birch fabric with antique brass ring. Thank you for your interest. Mai I ask where the rug is from? Beautiful room. Thank you! The rug, drapes, and wallpaper are in an overly active competition. - Beautifully done room! Can you tell me where you bought the large glass canisters and the white footed bowl? Beautiful decor, where are the curtains from? rug's manufacturer? - Hi i called Orient Express and only furniture stores or designers can get the items from them. I was wondering how i can get the orient express table and chairs. i googled and there are certain items that are not carried online. . please help thank you. The chairs have brown nailheads and the legs are espresso (dark brown). So, I guess this means someone will be staining a table. LOL. Thanks! - What is the size of this rug? The rug is by Jaipur and is MR40 Maroc Area Rug. Thank you for your interest and compliment. Sorry but we do not sell to the public. Thank you for your interest. - What are the measurements of the table? The table is from Orient Express. Royce Extension Table in Dutch Brown. Thank you for our interest. - Love the rug. Where did you get it? Could you give the dimensions of the rug?Thanks! What is the finish on the dining room table? - Can you tell me if the finish on the table and sideboard is highly polished for a "fine furniture" look or is it more textured and grainy for a little more casual look? The furniture store that I am working with does not have a wood sample of the Dutch brown, only the acacia finishes from Orient Express. Thanks--the room looks awesome! what size is the area rug? Hi Ashley! The area rug is an 8x10. Thank you for your interest. love the buffet...where did you get it and what is the size? i'm an interior design student, i'm wondering why you consider this room is transitional? is it the colors? The colors, patterns and mix of elements such as furniture, lighting and textiles. what is the size of the table? - What is the highest width and length table you would recommend for an 8 wide x 10 length rug? Where can I get the table? As designers we order from vendors the public does not have access to. However if you google the description below you should find places that carry the table. The table is Royce Extension table, Kingston collection, dutch brown finish. Thank you for your interest. Love the mirror! Where can i get it? Can you tell me where you found the rug? The rug is by Jaipur. Maroc MR40Antique White Medium Grey 8 x 10. Thank you for your interest. 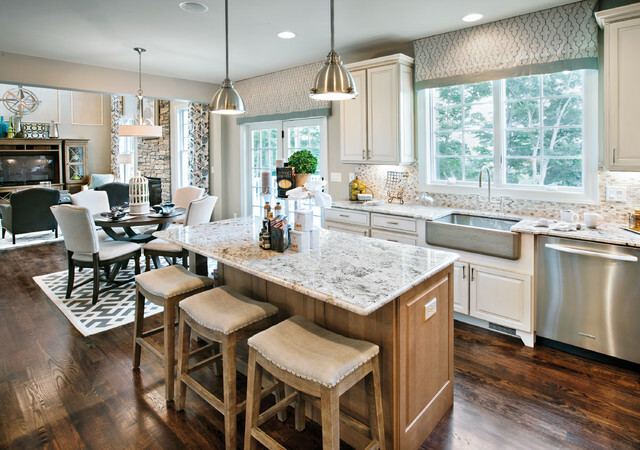 Love the table and window treatments. Where could I find those?? What a beautiful room! The minimal table decor is perfect for the look-what are in those glass canisters? So pretty! - I love this table and chairs where can I get something similar in the uk? Beautiful! What size table can I fit into a 11x11 room for 6 people? - Hello! I have a 11'7X11'10 room that I am trying to figure out how to fit a table, sideboard and 6 chairs in comfortably. I LOVE the look of this room but am getting really confused on what size and shape table I should/can use? length allows for more space to walk around the table than the 96” table. table to ensure they are able to tuck in. Thank you for your interest. Thank you so much for your help. I am marking it out on the floor and most likely going with the smaller of the two. - Hi what brand is the wallpaper? From previous comments on the photo ""The flooring is from Masterpiece Wood Floors. Species: Oak and finish is Dark Walnut 2716."" 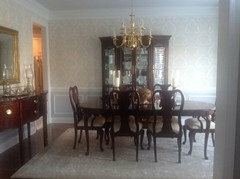 The wallpaper is by Thaibut, from the St. Lucia collection, Pattern #: 839-T-7040, Metallic on Cream. Thanks, good luck with your design project! Where can the chairs be purchased? The end chairs are 41.5" H and the side chairs are 41" H. Thank you for your interest. What colour paint is the ceiling? Flat finish on the paint. Thank you for your interest. I would love to know the source of this wallpaper. Beautiful room! Absolutely beautiful room. We are in the process of doing our dining room in our house we just built. Can you tell me where I can get the furniture and the rug? Thanks for the compliment. As Designers, we buy direct from the manufacturers so you will most likely need to google the manufacturer name and item to find where you can purchase locally. The rug is by Jaipur MR40 Maroc 8 x 10 in Antique White Medium Gray. 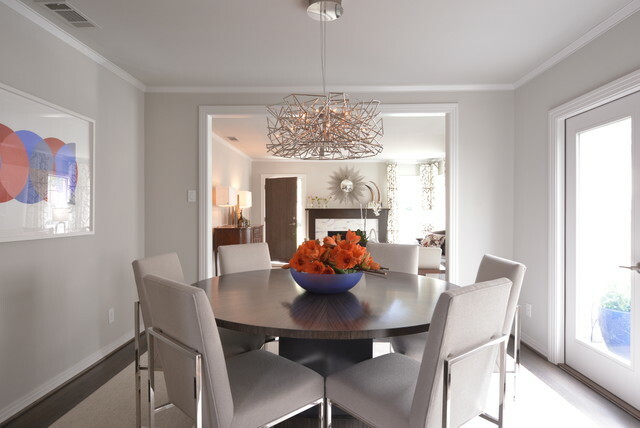 The furniture is all from Orient Express: Dining Table #7400 Kingston in Dutch Brown. Buffet #7410 Palladium in Dutch Brown with metal x back. Head Chairs #7120 Maison Dining Chair in birch fabric with small brushed brown nails. Side Chairs #7104 Graham Dining Chair in birch fabric with antique brass ring. Thank you for your interest. - Where is the rug from? Thanks! I saw a curtain in a model home with the exact same pattern and I've been searching up and down for the fabric with this rich blue diamond shape. If this is the same color, could you please tell me where I can find the curtain or the fabric, please. I fell in love with that curtain and just could not find it anywhere. Thanks so much!!! The fabric is from Maxwell Fabrics. Pattern: Intense and Color: 19 Metal. - What color is the tray ceiling and where is the buffet from? Could you pleAse tell me the rug source? Thanks! The rug is by Jaipur and is MR40 Maroc Area Rug. Thank you for your interest. - Where can I find these chairs in Canada? We buy direct from the manufacturers and they do not sell to the public. However, if you google the item it will take you to sites where you can purchase. The buffet is: Oriental Express #7410 Palladium Dining Console. Thank you for your interest. I actually do have a question! Hi I was wondering how i can get the orient express table and chairs. i googled and there are certain items that are not carried online. i called Orient Express and only furniture stores or designers can get the items from them. please help thank you. Orient Express should be able to tell you furniture stores in your area that carry the items or have the furniture store order them for you. Thank you for your interest. - Where is the table from? Does it extend? The table is from Orient Express Furniture. It does expand. - Hi! Please where can I find that mirror? Where is the chandelier from? Thank you. Mine was delivered on yesterday. I can't wait to get it assembled & hung. - How are the drapes attached to rod? It is invisible and exactly the look I want. The drapery is non functioning and attached directly to the wood. Thank you for your interest. this room is stunning. we love everything about it-- including the hardware on the seats!!! - Where can I find the table? The table is from Orient Express. Royce Extension Table in Dutch Brown. Thank you for your interest. - Who is the manufacture of the table and does it have a model name? where are the chairs from? Distance between buffet and chairs? 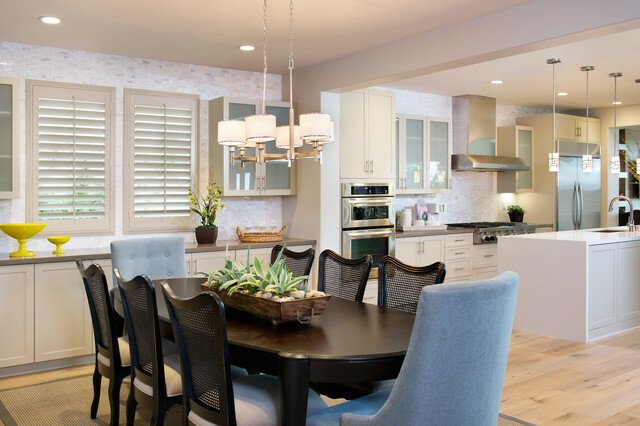 - I was advised on houzz that there should be at least 36 inches between chair and wall/buffet to allow for guests to move around the table. It does not appear to hAve that spacing in this picture. Can you please comment? I've been looking forever for a narrow buffet and would be so much easier to find a standard 18" deep one. Since this is a model we may have shortened the distance between the chair and buffet to be slightly less than the recommended 36". 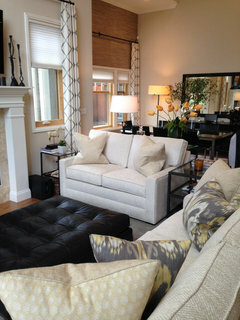 You will want 36" in a home since the chair will be pushed back from the table to allow room for someone to sit in it. Thank you for your interest. - Hi Mary What items are inside od the Apothecary decanters on the table? Shells are inside the decanters. Thank you for your interest. 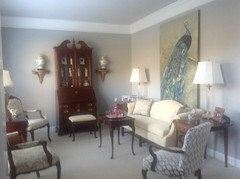 - Was there any other wall décor such as art, etc. added to this beautiful space? If so, what? Thanks in advance! There are only 2 full walls to this room. To the right is a half wall the breaks up this room from the living room and then it is open at the end leading to the kitchen. Thank you for your interest. Beautiful! Could you tell me the size of the room? The room is 14' x 12'. Thank you for your interest. Hi! I love this entire room! It's so gorgeous! Will a black table work with those chairs? - Where can the lamps be purchased from? Thank you. The lamps are from Kenroy Home. Item #32267AWH. Thank you for your interest. what is the dimension of this room? - Is it best to paint white under chair rail instead of painting it a color in the wallpaper? I have Coventry gray in foyer and LR and wanted to paint a bluish gray under wallpaper and chair rail in DR. What is best? It depends on the project, and what look you're going for. Both looks work, though. Best of luck! 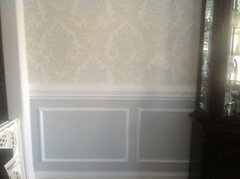 I did Coventry gray in living room, and wallpaper above chair rail and another BM paint below in dining room. Where is the white decorative bowl on the table from? It is from Global Views. The public can't buy direct from them but if you go to their website you can enter your zip code and find a retailer in your area that carries their items. Thank you for your interst. Where are the curtains from? I have this same drapery in my great room/dining room! We have good taste I can see! - love the mirror, where can I find it? 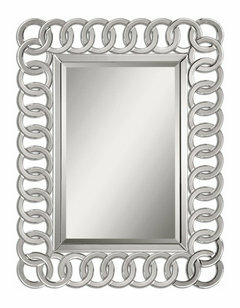 The mirror is from Uttermost #07627 Corbis Mirror. Thank you for your interest. The frame of this beautiful wall mirror is constructed of curved bevel mirrors in an interweaving pattern on a matte black wooden substrate. 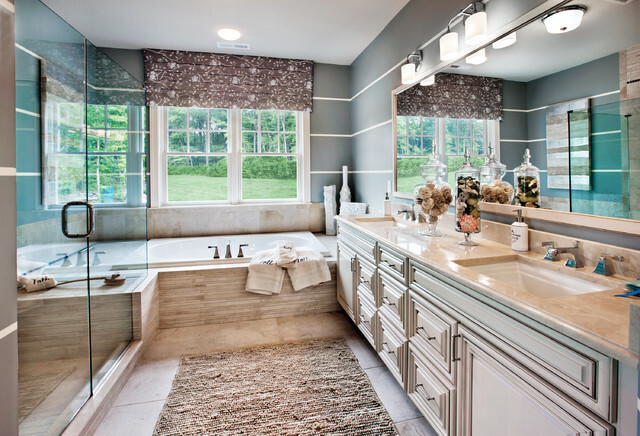 The mirror has a generous 1 1/4" bevel and may be hung horizontally or vertically. - Where can I purchase the curtains or the fabric? The closest fabric I have found is Suburban Home Rico Gray. Thank you for your help - I LOVE your design work! Love the look of these curtains. I have fabric but cannot tell -- are they mounted on a board or a rod? What are the dimensions of this room? - Who manufactures the mirror? 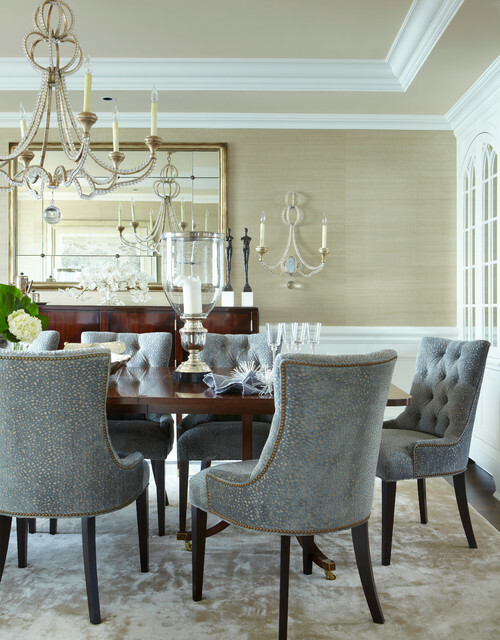 - What type or rod is being used for Dining Room Curtains? The curtains are mounted on wood boards that are then attached to the wall. Where can I find the rug and curtains? - Love them. Where are they from? The drapery was custom made using Maxwell Fabric "Intense" in color 19 Metal. The rug is by Jaipur and is MR40 Maroc Area Rug. Thank you for your interest. - - How are the curtains hung so close to the ceiling and what type of pleat? Thank You! Curtains are mounted on wood boards that are attached to the top of the wall. Additional fabric bunched together is the pleating. Thank you for your interest. - i want to see clear photo for the buffet plz ? - Where can I find this table and sideboard? The table is from Orient Express. Royce Extension Table in Dutch Brown. The buffet is from Oriental Express #7410 Palladium Dining Console. Thank you for your interest. - Hello! Where are the curtains from? - Where can I find these chairs? Who is the designer? - Where can I get the mirror? The mirror is the Caddoa Rings Mirror by Uttermost, Thank you for your interest. Would you put a lighter, pine table on a darker wood floor? I checked with one of our designers and she said a lighter pine table on a darker wood floor is fine. Thank you for your interest. What would this look be called? I would say Urban Chick. How are the curtains hung? Is there a rod or a track on the ceiling? The curtains are on boards that were affixed to the wall. Thank you for your interest. What size is the rug?? - What size is the rug? The area rug is 8 x 10. Thank you for your interest. - Where can I get these chairs? - Can you tell me where it's from? - Great room! The curtains seem to be suspended from the ceiling; am I correct? If so, can you share how it was achieved or what type of rails were used, please? The wallpapaer is manufactured by Thaibut, from the St. Lucia collection (pattern number: 839-T-7040.) Thanks for your interest. I love the table. Where can I find it? Can it seat 10 people? The table is from Orient Express. Royce Extension Table in Dtuch Brown. The table can extend to 94" but that is tight for 10 people. You can seat 10 (4 on a size and 2 on each end). The rule of thumb is each person needs 24". Thank you for your interest. - Can you please share where you got this wonderful mirror from? The mirror is from Uttermost and the style is "Caddoa Rings Mirror". Thank you for your interest. What can you tell me about the quality of these chairs? The above is a link to favorable reviews for these chairs. Thank you for your interest. I need those arm chairs! Where can I find them? - Can you tell me where the table was purchased and who makes it? Where are the curtains from?? - Just wondering where the curtains are from in this pic? Thanks! Could you do this look/style with a more glamour chandelier? We use scale and proportion in our design decisions. 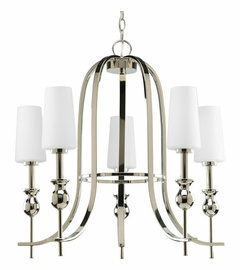 We felt this style and size chandelier worked best for this room. Thank you for your interest. The windows are by the builder so unfortunately I do not have that answer for you. Thank you for your interest. Are these chairs from restoration hardware? - Are these chairs from Z Gallery? Where are the chairs from? I love them! How are the window treatments mounted? 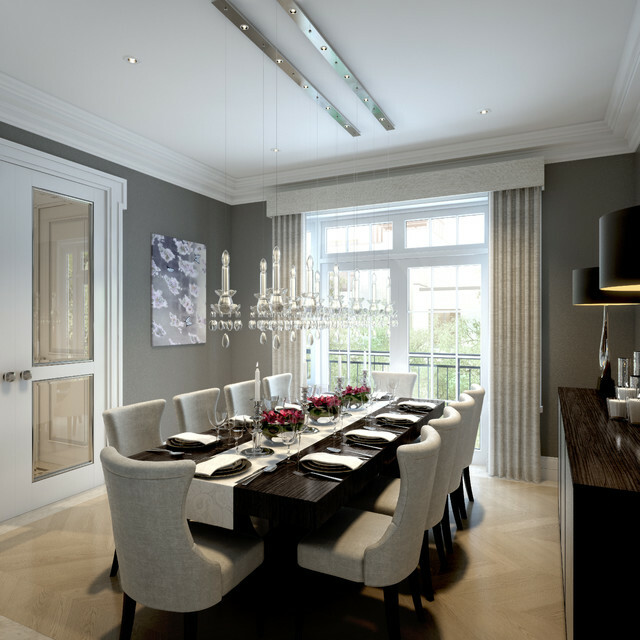 - Our dining room has similar windows with the trim almost reaching the ceiling. I don't want a rod to go all the way across, so I'm very interested in your solution. Thank you. Where is that rug from???? Beautiful!! - Any ideas on how to attach chair pulls like these? We did not attach them, they came this way from the vendor. Sorry we can't be of more assistance. Thank you for your interest. Can u tell me how much distance there is between chairs and buffet? There is 36" distance between the chairs and buffet. Thank you for your interest. 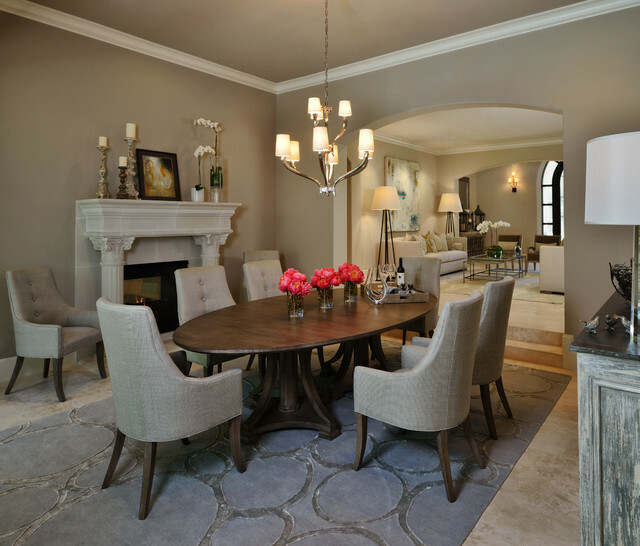 a 9 x 11 rug will work well with that size table. Thank you for your interest. - What are the dimensions of this room? I have a similar room that is 11'x11' and I'm wondering if this is a similar size. Thanks! Hello, the room is about 11' x 15'. Thank you for your interest. Hi weekesfamily5! The wallpapaer is manufactured by Thaibut, from the St. Lucia collection (pattern number: 839-T-7040.) Thanks for your interest. - Hi, love the buffet. I've been looking for one. Where can I found one like that. Hi ssopel, the buffet is from Orient Express #7410 Palladium Dining Console Buffet in Dutch Brown. It is 72W x 20D x 36H. Thank you for your interest! What is in the apothecary jars? The are from Global Views. The public can't purchase from them but if you go their website and enter your zip code they will give retailers in your area that carry their items. Thank you for your interest. How are the curtains hung? - I have a window with very little wall space between the window frame &amp; ceiling. Need a solution like this. Love the buffet lamps. Where did you find these? - Love this room!! Can you please tell me where the table is from? Love the wallpaper. Where could I find it. Love the chairs were are they from..? - Please disregard my earlier question about the curtain fabric - I found your earlier response that these are Maxwell Fabric Style: Intense, and found it online. Thank you! I love this room! Hope your design project turned out beautifully! love the rug, where is it from? The rug is from Jaipur and is MR40 Maroc Area Rug in Antique White and Medium Grey. Thank you for your interest. Love the mirror... where can I find the mirror? - Where can I find the mirror? - Where can I get this item to purchase? - Hi Mary. Where did yiu find the black footed bowl for the buffet? - Could you please let us know where we could find the table, it's lovely? - Holy moly! 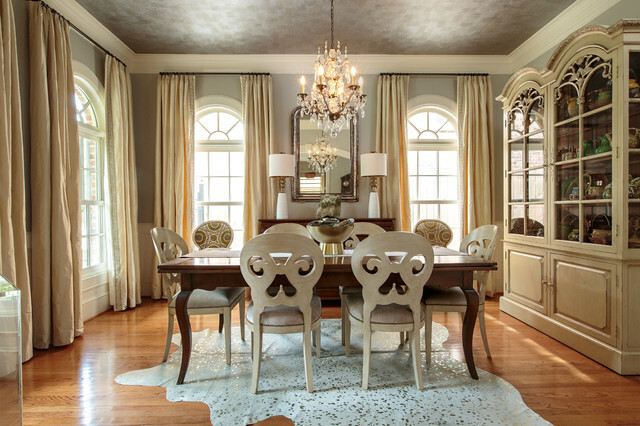 This dining room is beautiful! 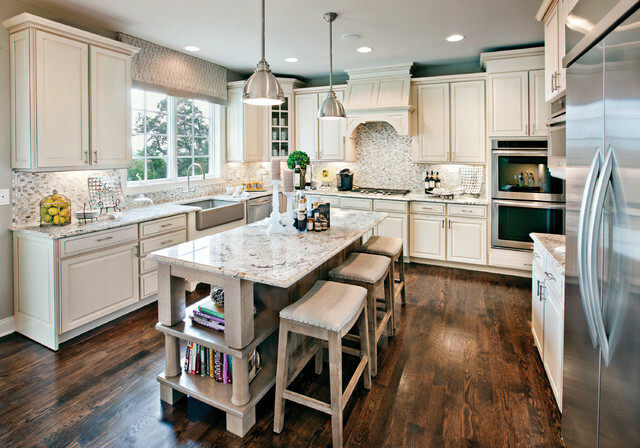 In love with those chairs....Do you have any recommendations for a cheaper alternative? - Hi Mary! 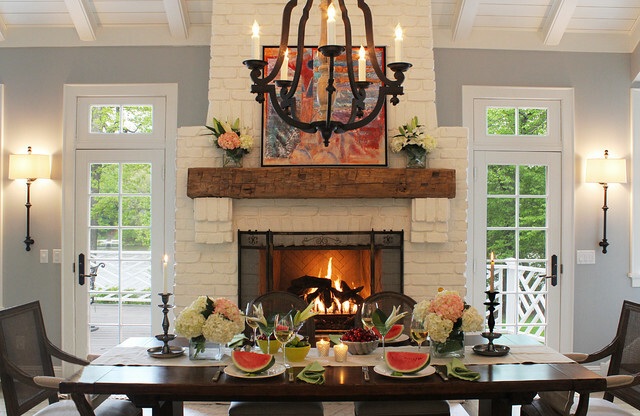 This beautiful room is my inspiration for my dining room which has a similar layout. I see the lovely mirror but I'm wondering what other wall décor did you add to the other areas of this room? Thanks in advance! - Hi Mary. Will a black table and console work with these chairs and wallpaper? Also, will the Safavieh Beige &amp; Anthracite work with this décor&gt; It costs half the price of the rug in this group, but appears to be similar.